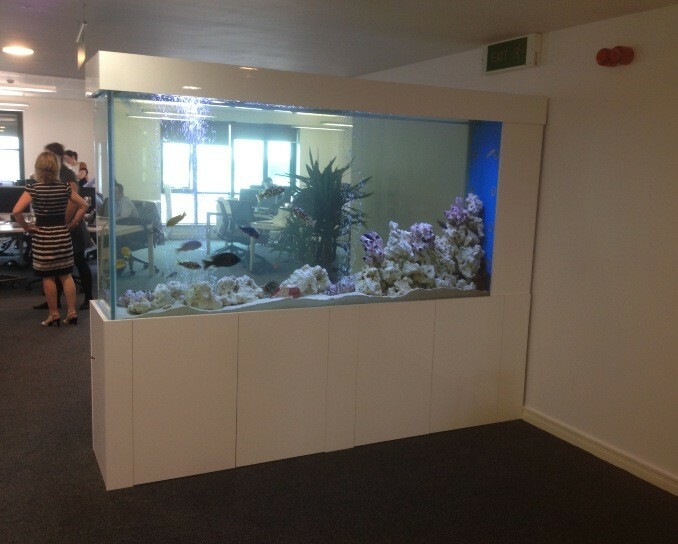 A bespoke office aquarium in insurance offices in York. This aquarium was built on site due to its size and weight. The aquarium has been fitted with external filters and a uv steriliser. The decor consists of ocean rock, coral sand and barnacles and the fish are African cichlids. The aquarium had to be installed on the third floor of an office building but was too large for the passenger lift and so had to be taken up 6 flights of stairs, one section at a time. It was then put together by our build on site specialists, this took approximately 3 hours. All our aquariums are built using specialist aquarium silicon which is selected for its longevity and strength. We are still maintaining aquarium which we installed 20 years ago which is testament to the build quality. Our client commented that this was ‘the best project I have been involved with in our offices’.